Austin, D.F. (2009). Neotropical Convolvulaceae. Twining herbs, lianas, subshrubs, shrubs, or trees, some species with milky sap; rootstocks sometimes large and tuberous, otherwise fibrous . Leaves usually simple , entire to pinnately lobed or pectinate, some species palmately compound , alternate , stipules absent. Inflorescences solitary in leaf axils or in racemose or paniculate dichasia, some dichasial basally and monochasial above. Flowers small and inconspicuous to large and showy, but usually wilting quickly after opening (mostly within 4-5 hrs), perfect or unisexual (some African species), actinomorphic or slightly irregular; sepals 5, distinct, imbricate , equal or unequal, persistent , occasionally accrescent ; corollas tubular, funnelform, campanulate , urceolate, or salverform, 5- lobed , 5-toothed or ± entire , with plicae (areas folded in bud ) and interplicae (unfolded in bud ), usually induplicate and often also convolute in bud ; nectary disc annular or cup-shaped, sometimes 5- lobed , occasionally absent; stamens 5, distinct; filaments inserted on corolla tube base alternate with corolla lobes; anthers dithecal, usually linear or oblong , extrorse or introrse; ovary superior , 2-4(-6)-carpellate, usually with as many cells, placentation basal or basal - axile , ovules 2(4-6) per cell, or ovary 1-celled and ovules 4, these erect , anatropous; style 1, filiform , simple or bifid, or sometimes with 2 distinct styles; stigmas capitate or bilobed, or, when stigmas 2, then linear , ellipsoid , or globose . Fruits capsular, dehiscent by valves, transversely or irregularly, or indehiscent and baccate or nut -like; seeds 1-4(6), often fewer than ovules, glabrous or pubescent , endosperm absent or scanty, cartilaginous , cotyledons usually foliaceous . Aniseia Choisy: S. Florida (adventive) to southern South America (southern Mexico, Mesoamerica, Cuba, Jamaica, Hispanola to Tobago, Colombia, Venezuela, Guyanas, Ecuador, Peru, Brazil, Bolivia, Paraguay). Argyreia Lour. : (native to Old World; widely cultivated in Americas, not naturalized). Bonamia Thouars: (Mexico to Brazil, Peru). Calycobolus Willd. ex Roem. & Schult. : (Colombia, Venezuela, Guyana, Peru, Bolivia, Brazil). Convolvulus L.: (Mexico, Mesoamérica, Venezuela, Ecuador, Brasil, Antilles, south to Chile and Uruguay). Cressa L.: (Utah to Arizona & New Mexico, Baja California to San Luis Potosí, Mesoamérica, Ecuador, Perú, Chile, Argentina). Dichondra Forst. & Forst. f.: (California, Arizona, New Mexico, Sonora & Chihuahua to Oaxaca, Mesoamérica, Antilles, Colombia, Ecuador, Perú, Bolivia, Paraguay, Argentina). Dicranostyles Benth. : (Costa Rica to Brazil and Bolivia). 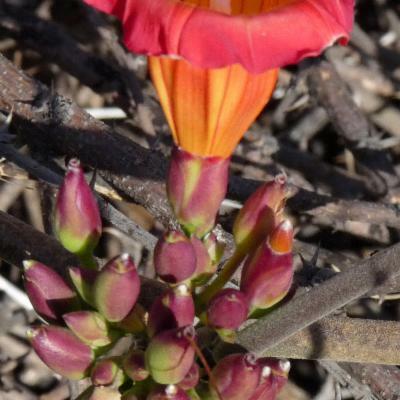 Evolvulus L.: (southern United States south to Brazil and Bolivia). Hewittia Wight & Arn. : (Jamaica, introduced). 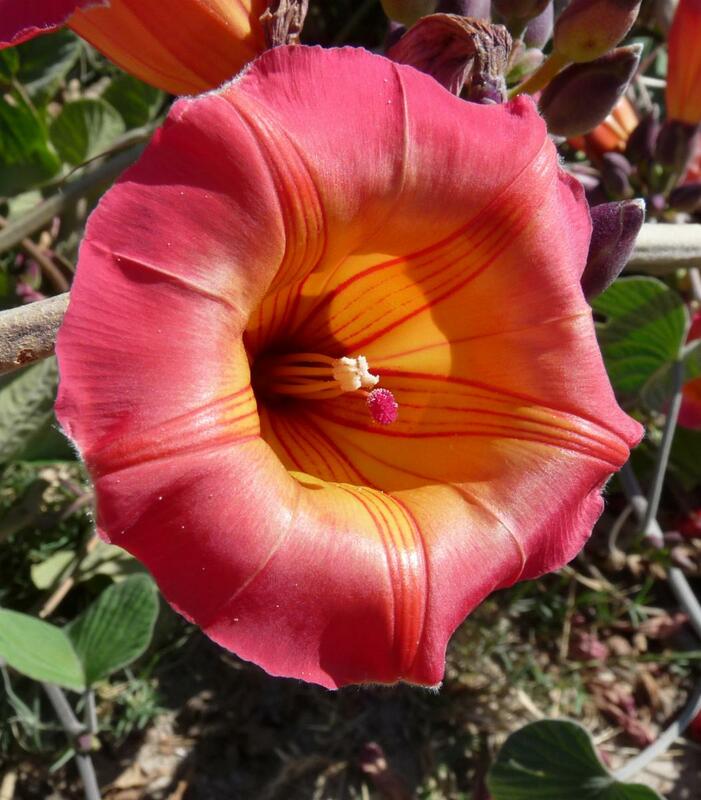 Ipomoea L.: (southern United States to Chile, Uruguay). Iseia O'Donell: (Mesoamérica, Colombia, Venezuela, Ecuador, Perú, Brasil, Paraguay, Argentina, Trinidad, Tobago). Itzaea Standl. & Steyerm. : (Veracruz, Mexico to Nicaragua). Jacquemontia Choisy: (Arizona, Florida, Baja California Sur & Sonora to Veracruz, Oaxaca, Mesoamérica, Venezuela, Columbia, Ecuador, Brasil, Argentina). Maripa Aubl. : (Chiapas, Mexico south to Peru and Brazil). Merremia Dennst. ex Endl. : (southern United States, Mesoamérica; Colombia, Venezuela, Guayanas, Ecuador, Perú, Brasil, Bolivia, Paraguay, Argentina, Antillas). Odonellia K.R.Robertson: (Tamaulipas, Oaxaca, Veracruz, Mexico through Mesoamérica, Colombia, Venezuela, Ecuador, Perú). Operculina Silva Manso: (Mexico through Mesoamérica, south to Brazil). Poranopsis Roberty (cultivated and naturalized from Asia). Stictocardia Hallier f. (native to Old World; widely cultivated in Americas, naturalized in Florida, the Caribbean, South America). Turbina Raf. 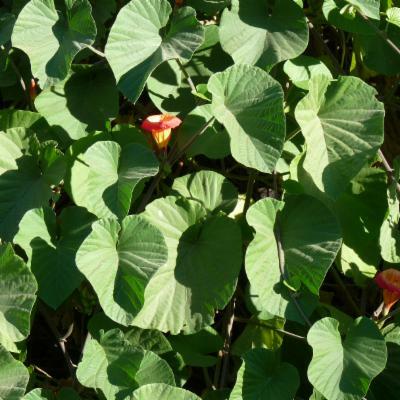 (naturalized in Florida and Texas; Mexico, Mesoamérica, Ecuador, Colombia, Venezuela, Trinidad, Perú, Brasil, Bolivia, Paraguay). Xenostegia D.F.Austin & Staples (Puerto Rico, naturalized). Milky sap or latex usually present (sometimes inconspicuous). Erectsessile ovules with basal to axile placentation. Bicollateral vascular strands are present. Fruits (dehiscent, indehiscent, number of valves). Trichomes (stellate in many Jacquemontia and a few Ipomoea ). Pollen (colpate, polycolpate, porate; surface spinulose [visible with 10x magnification] or microspinulose [visible only in light or SEM microscopy]). Aniseia & Calycobolus: Two outer sepals larger than inner three; fruits dehiscent in Aniseia, indehiscent in Calycobolus. 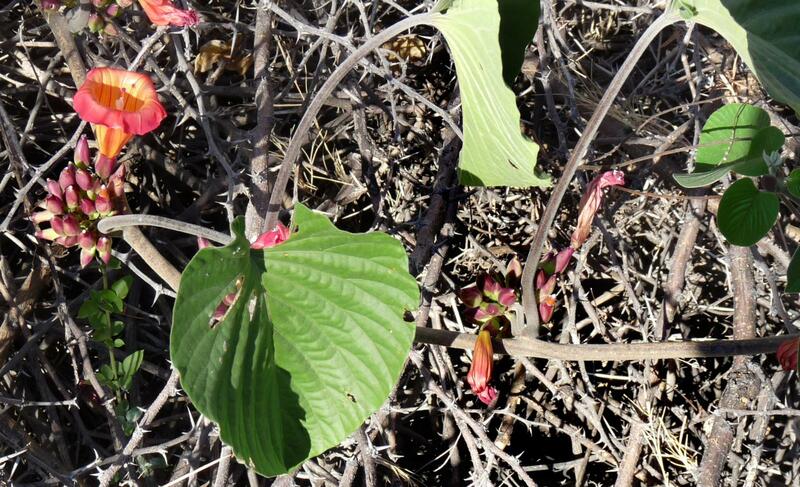 Cressa: Subshrub, haline sites, white flowers. Dichondra: Creeping stems; leaves kidney-shaped; flowers inconspicuous. Evolvulus: 2 separate styles each with 2 clavate stigmas. 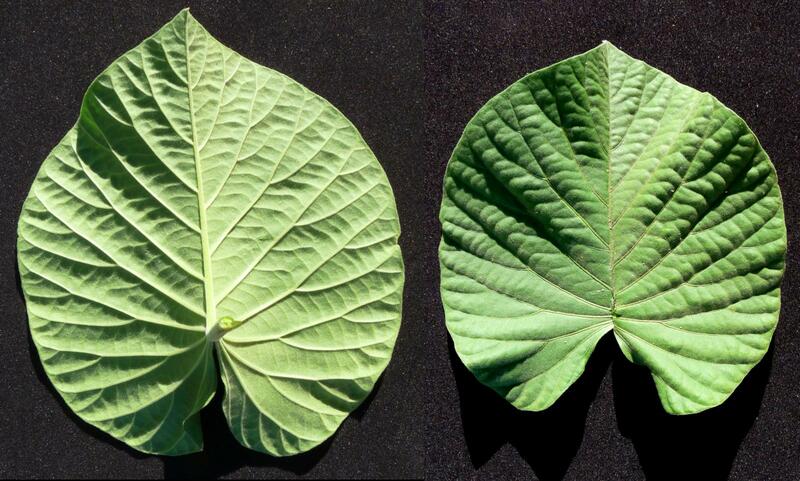 Jacquemontia: Stigmas oblong-flattened; fruits with >8 valves or valve segments; often with stellate trichomes. Merremia & Operculina: Fruits capsular in Merremia, operculate in Operculina; pollen smooth, 3-multiple colpate. Ipomoea: Pollen spinulose (visible with 10x magnification), pantoporate (requires microscope). Turbina: Fruits chartaceous, indehiscent, typically 1-seeded. 26 genera (see Distribution above). Austin, D. F. and Rosangela Simão Bianchini (1998). 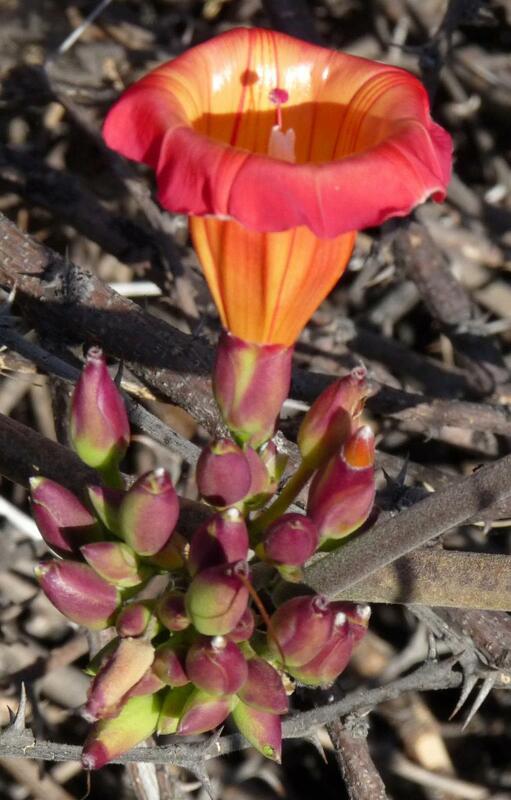 Additions and corrections in American Ipomoea (Convolvulaceae). Taxon 47:833-838. Hallier, H. (1893). Versuch einer natürlichen Gliederung der Convolulaceen auf morphologischer und anatomischer Grundlage. Botanische Jahrbücher für Systematik, Pflanzengeschichte un Pflanzengeographie 16: 453-591. McDonald, J. A. (1991). 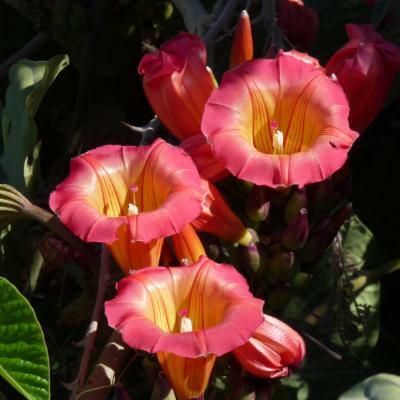 Origin and diversity of Mexican Convolvulaceae. Anales del Instituto de Biológia de la Universidad Nacional Autónoma de México, Série Botánica 62(1): 65-82. McDonald, J. A. and T. J. Mabry (1992). 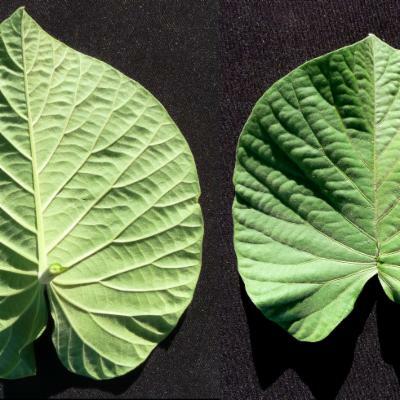 Phylogenetic systematics of New World Ipomoea (Convolvulaceae) based on chloroplast DNA restriction site variation. Plant Systematics and Evolution 180: 243-259. Stefanovic, Sasa, D. F. Austin, and Richard G. Olmstead. (2003). 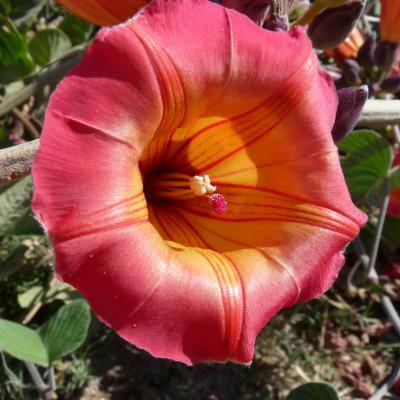 Classification of Convolvulaceae: A phylogenetic approach. Systematic Botany 28(4)91-806. Every, J.L.R. (2010). Neotropical Cuscutaceae. 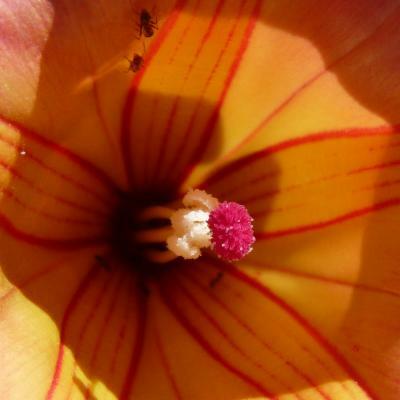 Herbaceous , stem -twining parasitic vines; root system very short lived; stem filiform , yellow, red or orange in colour. Leaves reduced, spirally arranged, simple , sessile , scale-like, glabrous , mostly achlorophyllous; extra-floral nectaries sometimes present. Inflorescence axillary , cymose, spicate or in heads. Flowers regularly symmetrical, bisexual , bracteate or not, disk present; sepals 3-5, imbricate , persistent ; petals 3-5, imbricate , gamopetalous; corona fimbriate , alternating with stamens; stamens 5(-10), adnate to and alternating with the petals; anthers adnately fixed or +/- versatile, dehiscing by full-length longitudinal slits; ovary superior , syncarpous, carpels 2, locules (1-)2(-4), styles 1-3, separate to connate . Fruit a long-beaked capsule (rarely indehiscent ). Seeds 1-6, embryo coiled, acotyledonous. 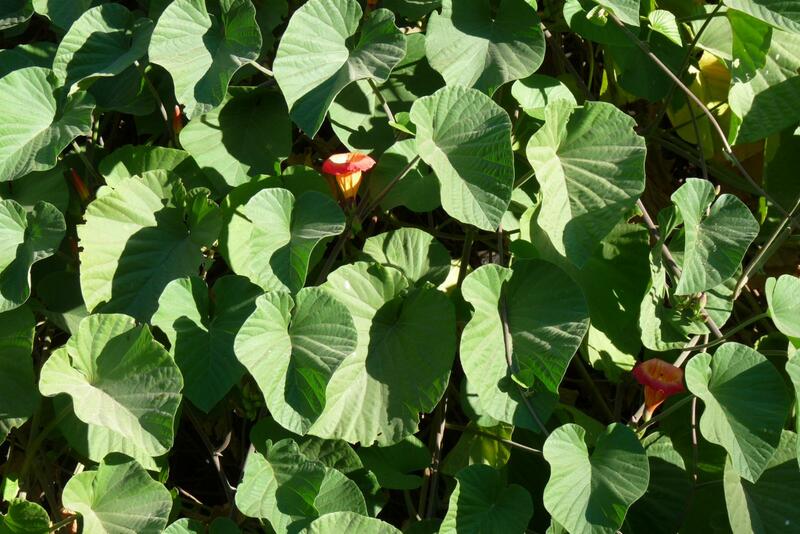 Can be found throughout the Neotropics growing in mesophytic habitats - particularly along streams and in areas associated with anthropogenic ecosystems. Occasionally found in halophytic areas (Cuscuta salina Engelmann). Brightly coloured stem -twining parasite. 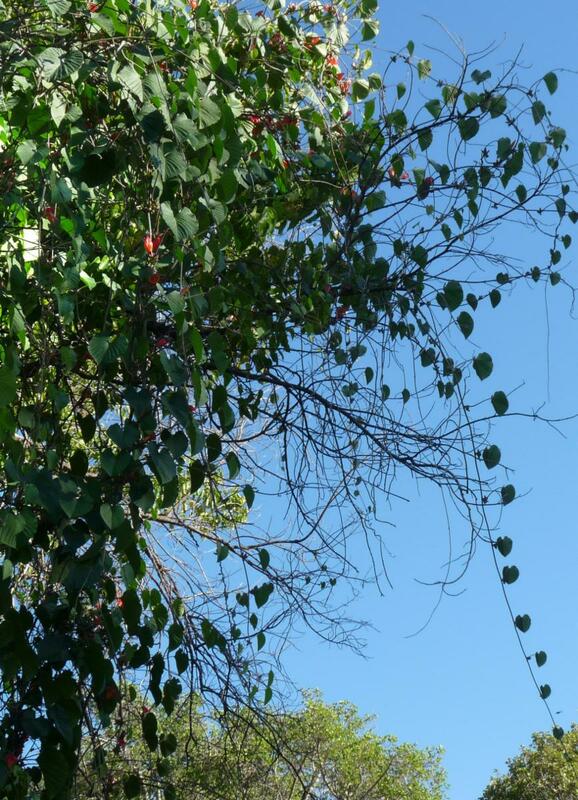 Differs from Convolvulaceae in that Cuscuta L. is often chlorophyll-lacking and parastic, has a withering terrestrial root system which is short-lived, and no internal phloem. Has similarities with species of the genus Cassytha Miller of Lauraceae, such as its parasitic tendencies, but can be distinguished by Cassytha's greater numbers of floral parts. 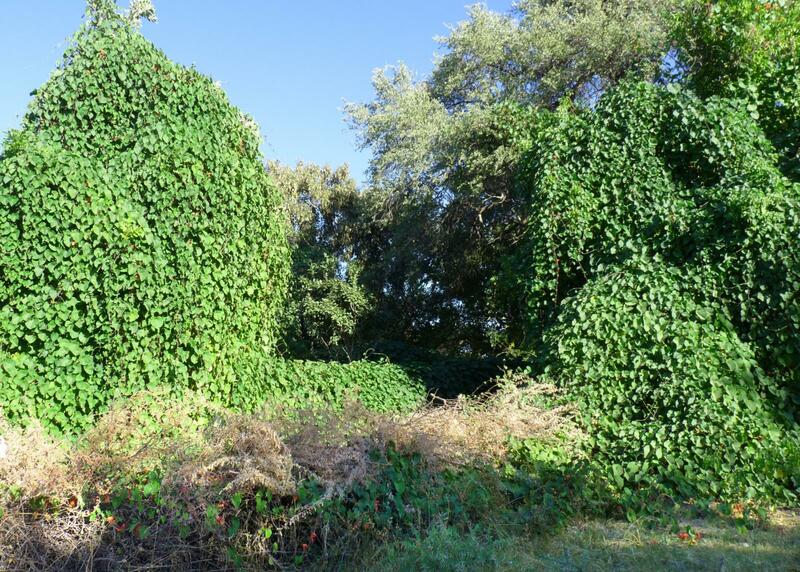 One: Cuscuta, with approximately 50 species. Native and introduced via shipments of commercial seed. Also known as Dodder and Devil's Guts, members of the Cuscutaceae are regarded as some of the worst weeds in the world. Attaching to their agricultural hosts through haustoria and twining around their victims they steal light and nutrients from valuable crops. 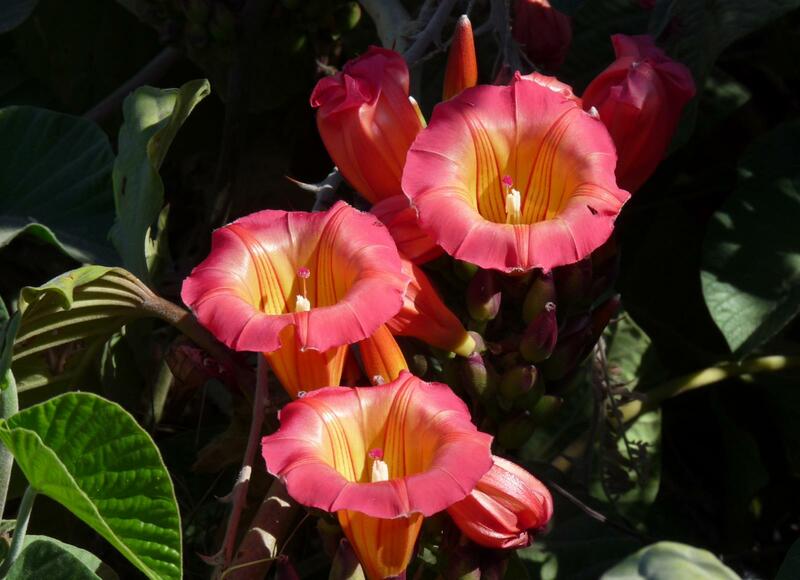 Commonly included as one of the twelve sub -families of the Convolvulaceae, including in the most recent angiosperm classification undertaken by the Angiosperm Phylogeny Group (APGIII, 2009). Heide-Jørgensen, H.S. 2008. 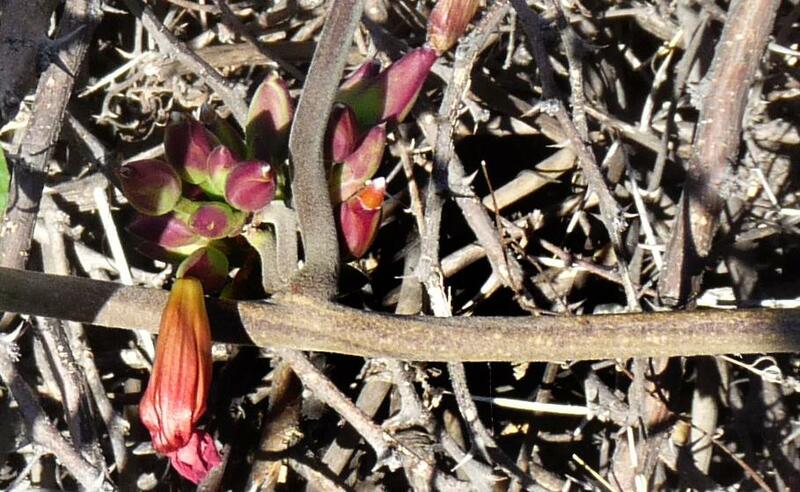 Parasitic Flowering Plants. 438 pp. Brill, Leiden. Kuijt, J. 1969. 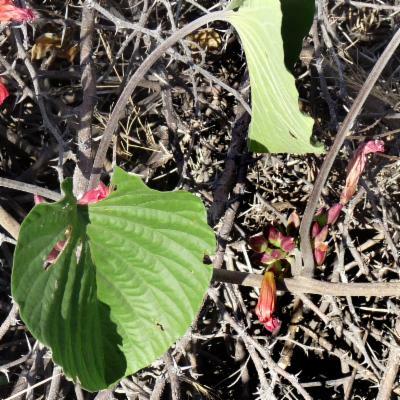 The Biology of Parasitic Flowering Plants. 246 pp. University of California Press, Berkeley, California. Maas, P. J. M. & Westra, L. Y. Th. 2005. 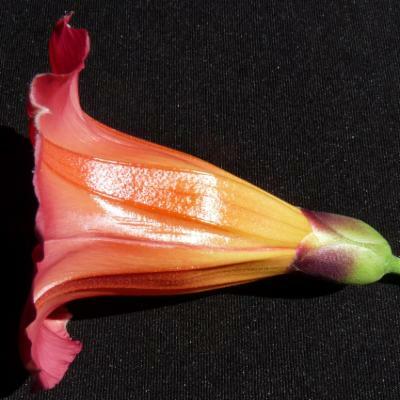 Convolvulaceae. 358 pp. Neotropical Plant Families. 3rd ed. Musselman, L.J. 2004. Cuscutaceae. In: Smith, N., Mori, S.A., Henderson, A., Stevenson, D.W. and Heald, S. . (eds.). Flowering Plants of the Neotropics. Pp. 124-5. The New York Botanical Garden, Princeton University Press, Princeton. Nickrent, D.L. 1998-onwards. 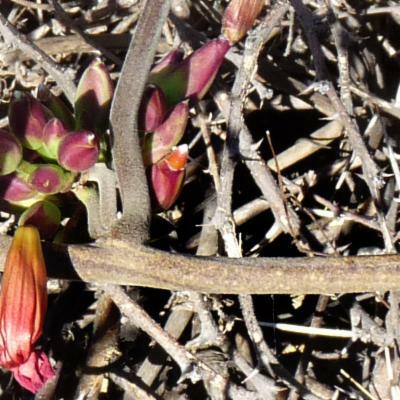 The Parasitic Plant Connection. 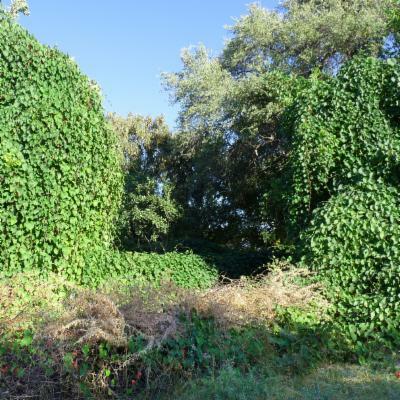 http://www.parasiticplants.siu.edu/. Staples, G.W. & Brummitt, R.K. 2007. 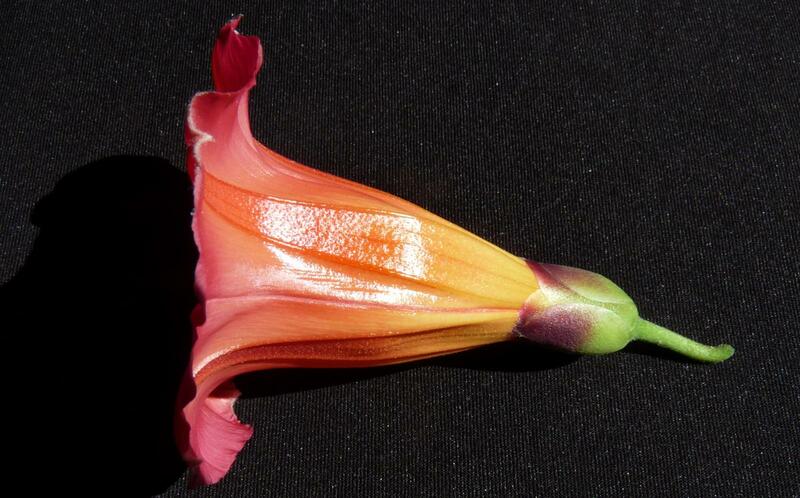 Convolvulaceae. In: Heywood, V.H., Brummitt, R.K., Culham, A. & Seberg, O. (eds.). Flowering Plant Families of the World. Pp 108 - 110. Royal Botanic Gardens, Kew. Yunker, T.G. 1932. 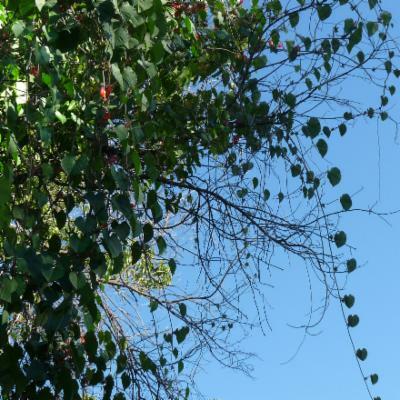 The genus Cuscuta. Mem.Torrey bot. Club 18: 113-331. Yunker, T.G. 1965. Cuscuta. N. Amer. Fl., ser. 2, 4: 1-51.